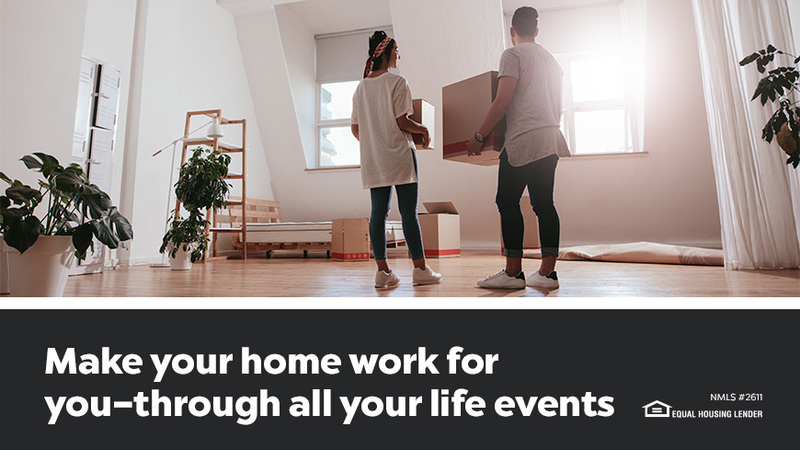 Whether it’s an exciting milestone and you’re sending your child off to college, or something unfortunate has occurred, these major life events carry a spectrum of emotions as well as a multitude of financial implications. You’ll want to make sure you’re making the best decisions and making your house and mortgage work for you. Read on for some suggestions on when refinancing could come in to assist. HELOCs work similarly to a credit card. You pull from your home equity and are given a line of credit available for a set timeframe (typically 10 years). Options include interest-only draw periods or draw periods with both interest and principal. With a home equity loan, you’ll receive one-lump sum to be repaid over a fixed term at a fixed interest rate. Essentially, you’ll be taking the equity you’ve built up in your home and turning it into tuition payments. You’ll want to make sure you have enough equity built up so that your cash-out-refi won’t increase your loan-to-value (LTV) ratio to over 80%. When your ratio exceeds this amount, you’ll need to purchase mortgage insurance. Divorce can be complicated on so many levels. Your mortgage doesn’t have to be. You have options whether you’re staying or selling. If you decide one of you wants to stay you can refinance your joint mortgage. For example, if you refinance the mortgage into your own name, you’ll factor in only your income and credit score, then cash out a portion of your equity to buy out and pay your spouse his or her share (or vice versa). Your first decision will be whether you’re keeping the property or selling. Either way when a property is left to an heir (or heirs) the property goes into an estate which is then distributed out after paying any withstanding debts on the estate. If you want to keep the property, and you’re the sole beneficiary, you can refinance into a new mortgage and acquire both the title and estate. If the estate has been left to multiple heirs, you’ll have the option to refinance and disperse the proceeds accordingly so that each heir recoups the value of their share. As you fine-tune your 401k and overall financial plan, you’ll want to consider what’s likely your largest asset—your home. Whether you’re looking into downsizing, buying a second home or refinancing your current mortgage, you have options that could leave you with a lower interest rate or help maximize your tax savings. The mortgage application process is the same for both retirees and working adults, the difference being retirees will often need to set up an income stream or use their assets to demonstrate their ability to repay. This can be done by setting up periodic payments, which verify access to necessary funds. Assets can also be taken into consideration to satisfy an insufficient income. To explore interest rates and options, you’ll want to maintain a high credit score and increase your home’s appraisal by completing any necessary maintenance tasks. Consider all your options and speak with a licensed loan officer to ensure you’re making the most of your home and your mortgage.